Issue #254: LUKE CAGE, Origin Stories, and DOOMED! This week, the Talking Comics crew welcomes Marty Langford back to the podcast for an update on his upcoming documentary, DOOMED! 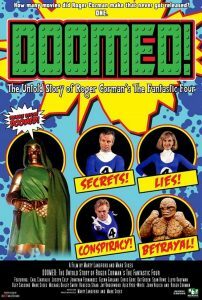 The Untold Story of Roger Corman’s THE FANTASTIC FOUR. Bob leads the lively conversation through the World’s Greatest Unreleased Cult Film!!! DOOMED! will be released VOD on 10/11/2016 and on DVD 12/20/2016!!! Also, Steve attended the freaking premiere of Luke Cage!!! The gang talks their general (NON-SPOILERS!!!) impressions on the latest Marvel series from Netflix!!! Of course, it’s not all TV and Movies, as the crew talks tons of comics, including Josie and the Pussycats, Spider-Woman, Ms. Marvel, Lake of Fire, Jill Thompson’s Wonder Woman: The True Amazon, and the just-announced The Spirit: The Corpse Makers by Francesco Francavilla. Talking Valiant Episode #59: X-O Concludes! Long Live the King!